These pretty kittens were rescued from a soi where the dogs roam.. 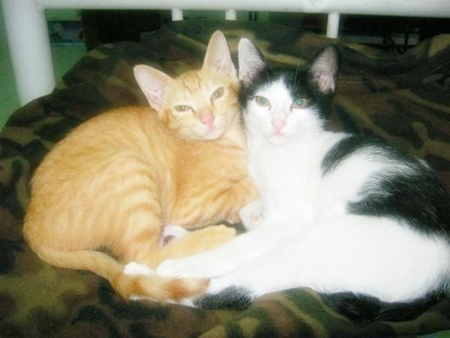 The mother cat has now been sterilised by the Cat Sterilisation Program and will stay on the street but we want to give these two a chance for a loving home.. They have already been with us for 6 weeks so are well used to home comforts and a cozy lap to curl up on! 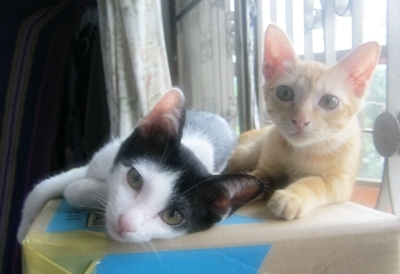 The boy is black and white with a cute Thai tail and the girl, all red tabby. Must be homed together. Had 1st vaccine and booster and are litter trained. Ring Gilly 0871 891623 [email protected] www.catsterilization.org.